Racing main and Jib reported to be in good condition, cruising main and Jib reported to be in serviceable condition, both spinnakers reported to be in good condition. Carbon bowsprit for spinnakers and top down furler sails. 12 volt, 2 batteries charged by: engine, solar panels 2 x 180 A/h AGM Batteries. 1 x 135 W & 1 x 170 W solar panels. Spare fortress anchor has 50 metres of rode. Designed by Alan Carwardine the super light Stealth 11.8 is fast and responsive and equally at home on the regatta circuit or cruising comfortably, She and her sister ships have dominated the multihull classes on the Asian regatta scene in recent years. Constructed from vacuum bagged foam / epoxy composite with carbon fibre in high stress areas, to keep the weight down and strength up, she features a prepreg carbon rotating mast, carbon boom, dagger boards that are flush with the deck when retracted and retractable rudders. The 20 Hp 4 stroke outboards retract on tracks and are stowed under the cockpit sole. The mainsheet track is mounted on top of the hard bimini which gives plenty of shade and an uncluttered open plan cockpit saloon area. Drop down forward saloon windows provide maximum ventilation to the saloon which features a good size galley with fridge, and down below are 2 x double cabins, 2 x single cabins, heads / shower room and store room. Thai Flagged and commercially registered. 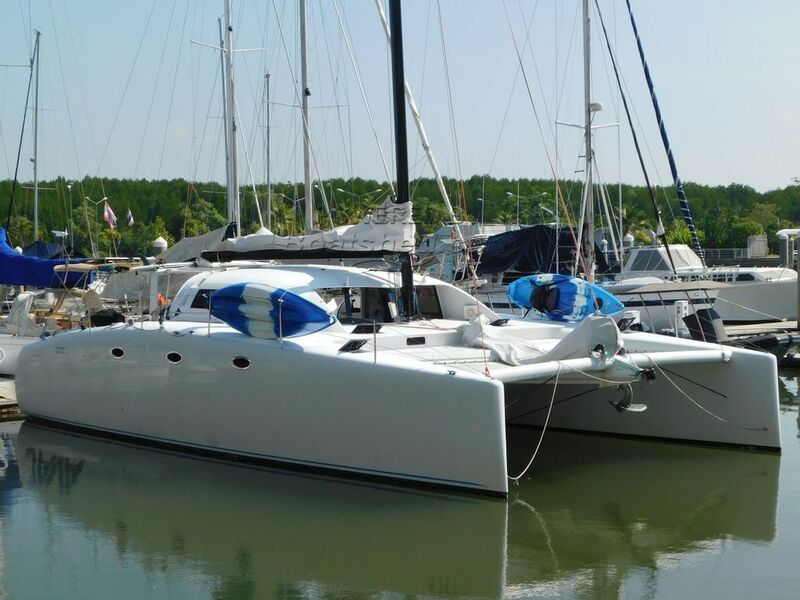 This Stealth 11.8 Fast Cruising / Racing Catamaran has been personally photographed and viewed by Alan Giles of Boatshed Phuket. Click here for contact details.